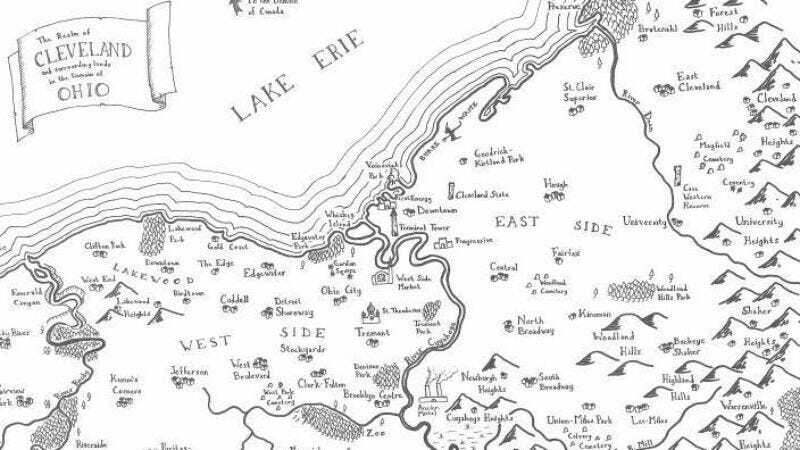 A fantasy map of Cleveland? Talk about the desolation of smog! Those who fancifully refer to their daily commute as “there and back again” will likely be excited to learn that Stentor Danielson, assistant geography professor by profession and whimsical cartographer at heart, has been creating maps of major American cities like Cleveland and Pittsburgh in the style of fantasy author J.R.R. Tolkien. In addition to his de riguer Etsy store, a seeming must for endeavors of this nature, Danielson also maintains a densely-illustrated Tumblr called Mapsburgh, where he showcases his own work as well as that of other fantasy-minded artists and creators of odd, impractical things. There, brave travelers will get some brief, telling glimpses into the mapmaker’s creative process, which seems to exist at the nexus of fandom and fetishism. A specifically-cited source of inspiration for Danielson, for instance, is this map of Middle Earth from the Ballatine paperback edition of Tolkien’s Lord Of The Rings. A faculty member at Pennsylvania’s Slippery Rock University, Danielson works with pen and ink and, on occasion, cut paper to create his otherworldly “cartographic art” of quite-worldly places like Boston and Washington, DC. The artist, who describes his work as “delicate” (read: alarmingly fragile), also takes requests.